You are here: Home / Life / Entertainment / What in the World Is Up With Kanye West? You love him. You hate him. You most definitely love to hate him. Kanye West is the name, doing whatever he pleases is his game. Kanye has released groundbreaking albums including his debut College Dropout, the ever-emotional 808s and Heartbreaks and overall masterpieces like My Beautiful Dark Twisted Fantasy. Considered by some (including Kanye himself) as one of the greatest artists of the 21st century, Kanye’s legacy riddles with controversy. Where were you when you heard “Now, Taylor, I ‘ma let you finish…?” With his new fashion line “Yeezy Season Three” and his latest album The Life of Pablo, the clock ticked until he decided to act up again. If you have a Twitter account (or any concept of what social media is for that matter) you’ve seen Kanye publicly announcing his $53 million dollars in debt. What? The guy who married into the Kardashian dynasty is in debt? The man who made a million per show on his Yeezus tour is in debt? As CNN officially reported—yes, it would seem so. “I don’t really think Kanye West is in debt, because it isn’t real debt. It’s more of artistic donations given to him that he hasn’t played back, but apparently he doesn’t need to,” Florida International University sophomore Carlos Crespo said. Kanye clearly doesn’t agree—he even asked Mark Zuckerberg for a billion dollars, who hasn’t responded to West. 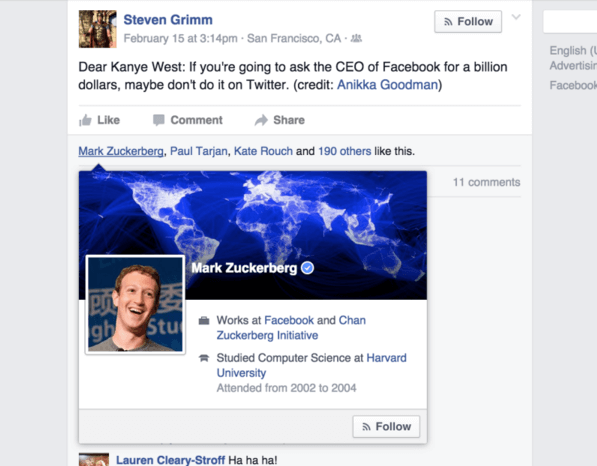 However, it’s clear Zuckerberg is keenly aware of Kanye’s humble request. Kanye continued his Twitter rant by talking about how a friend’s roughly $378 daily salary hinders her from buying her son’s $400 schoolbooks. Now, instead of taking a stab at the education system, let’s first bust some facts out. This friend of his earns somewhere around $137,930 a year. According to 2014 U.S. Annual Census, the average American citizen makes a yearly income of $52,000. Thus, she makes roughly $95,000 dollars more than your average Joe. So with all due respect here, many of us buy those very same books with far less of an income to work with. 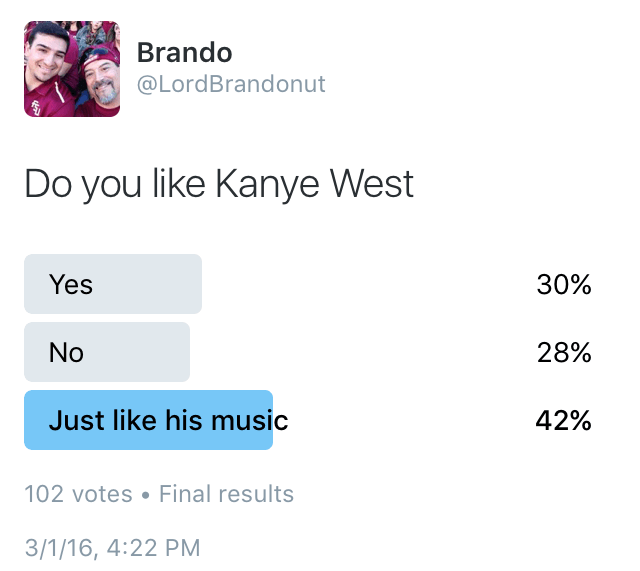 Alright, The Life OF Pablo is the very definition of the fire emoji. You can go from balling your eyes out listening to “Ultra Light Beams” to pre-gaming for the ABC themed party while bumping “Freestyle 4.” However, it’s no MBDTF or 808’s and Heartbreaks, as it seems to fail where many of his other albums succeeded. “I can describe [as] a greatest hits album of songs you’ve never heard. The ordering seems off and disjointed for an album, but all the tracks are great,” said Florida State University junior Steven Tolbert. Oh, I forgot to mention that he finally made a song about himself, predictably titled “I Love Kanye.” Humble, right? Considering Kanye’s recently outed debt, wouldn’t it be smart to upload that bad boy to Apple music so the world could buy it and he could make all that money back? But that idea must’ve been preposterous to Kanye, because he swears he only released the album on Tidal.com, most likely to support his close friend Jay-Z, owner of Tidal. As a proud believer in bro-ship, I understand looking out for your buddy. But c’mon, Kanye—you look like a grade A d-bag dressing your three-year-old daughter in expensive white furs while complaining about your debt. Ever since announcing TLOP, Kanye’s random social media tangents have considerably increased. Granted, what else could we expect after he announced #Kanye2020? His latest tangents, however, suggest Kanye has lost his goddamn mind. One minute he’ll go on a giant rant about the education system, then twist into a tweet titled “Family” with a picture of a microwave. Wait, I just remembered that was actually my tweet. Anyhow, if you haven’t kept up with Kanye’s twitter barrage, here are some of the highlights. Get it, like the song “Highlights” on the album? Man, that was lame. Well not to brag, but my fade away is pretty filthy if I do say so myself. I mean, at least he admits it. …I’m about to give up. He must have just finished watching Step Brothers. Hey, a little honesty never hurt anyone, right? Regardless of whether you love him or hate him, he’s going to be around for a long time, so you might as well embrace him and enjoy his music, like “America’s Father” Bob Saget does. To wrap it up, decide who you align with. The fans, the haters or the people who just like his music. Can’t wait to see what your new Twitter rant is about, Kanye. Tweet on.